For Thursday, snow moves into the Cookeville area during 8 to 10 am range (as of now) with heavier snow as the day wears on. Any snow that falls will stick to the road surfaces and cause dangerous driving conditions. This will be a dry, powdery-type snow and west wind of around 15 mph will make the day feel very cold along drifting the snow that has fallen. 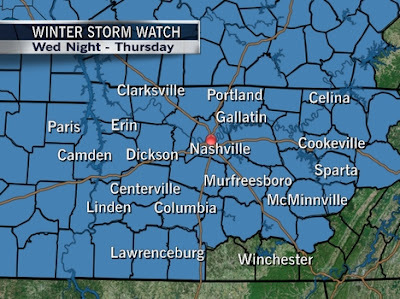 By Thursday evening at sunset, conditions will worsen and travel will be highly discouraged. You can forget about any melting of the snow overnight and more is expected to fall into Friday. Accumulations in the Cookeville area by the end of the snow event could reach the 4" range. With blowing snow, drifts could be as high as 6". This is a fluid situation and it is a good idea to check your weather sources for changing forecasts and conditions. School closing links are on this blog on the right-hand side near the top. ...our average temperature for the month of January is just 19°. Our average high has been 25.6° (thanks, in part to a high of 34° on New Year's Day) while the average low temperature has been 13.3°. WOW, now that is cold! ...we have gone more than 100 straight hours under 32° and that number (if we don't top 32° on Wednesday) will swell to nearly 235 hours by the time we do warm over freezing. That day is expected to be Monday! Stay tuned!